This Top Sirloin Steak with Mustard Sauce recipe is my go-to dinner for busy weeknights when I’m craving red meat! It’s fast, healthy, and delicious. We are nearly through the month of September, which means here on the blog, our month of Simple September Dinners is drawing to a close. But fear not, you know I love me some quick and easy recipes. There are plenty more of them in our future. This month we made Easy Teriyaki Chicken using chicken thighs and Basil Chicken Pasta with chicken breasts. 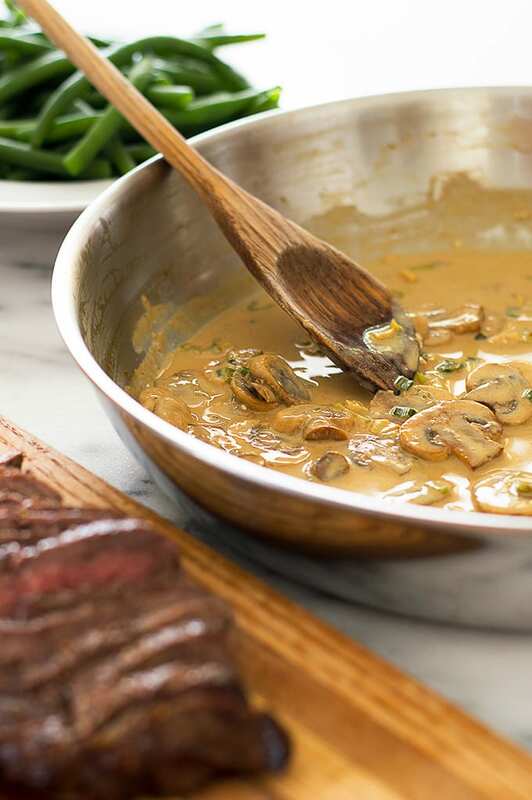 We are finishing out the month with something a bit more robust: Quick and Easy Broiled Steak With Mustard Sauce. I almost never cook red meat during the work week, because I try to keep weekday meals light and easy, but if I do make steak between Monday and Thursday, it’s almost 100 percent sure to be this recipe. Broiling steak is the easiest, least fussy way to cook steak, and as long as you don’t grossly overcook your meat, your steak’s going to come out juicy, tender, and flavorful. For this recipe, you just toss a little salt and pepper on some top sirloin and stick it under your broiler. 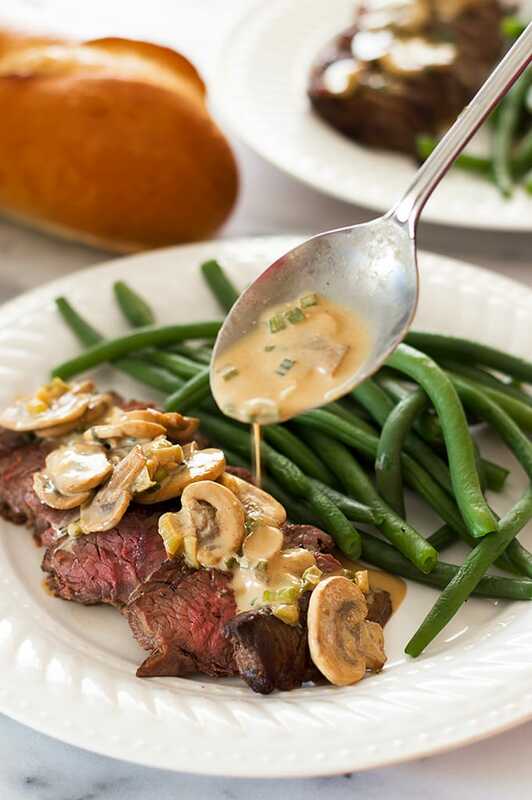 During the short time that your steaks require to cook, you give some mushrooms, onions, and garlic a quick saute, steam some green beans, and throw together a quick mustard sauce, which is just beef broth, sour cream, and mustard. The mustard sauce is a little tangy from the sour cream, creamy, but not too rich. 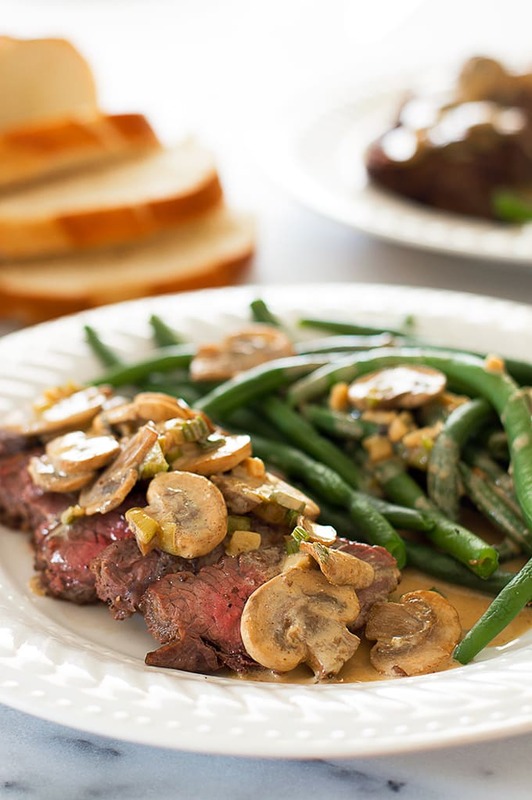 I love the way it tastes poured over the top sirloin, but it’s also a killer topping for your green beans. I usually don’t feel like green beans need a ton of dressing up, but this sauce, I’ll allow. Also probably hog and not share. 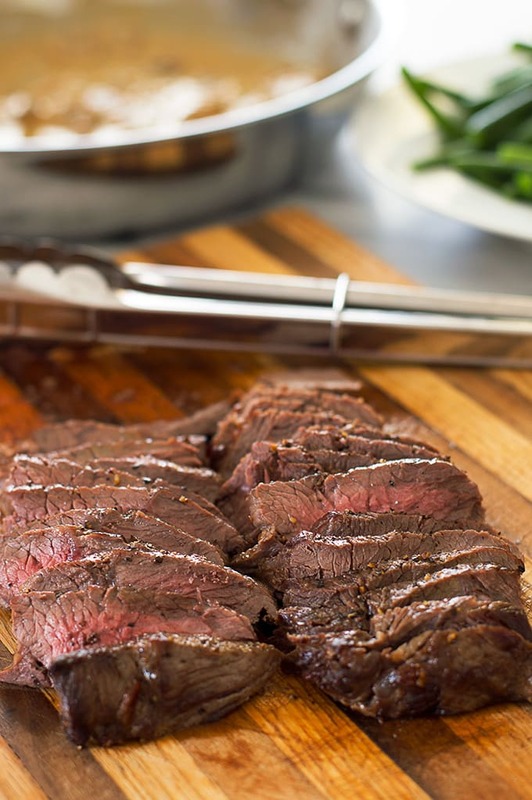 The entire meal takes about 20 minutes from start to finish and if you’re in the mood for a healthy steak dinner, you won’t find better than this. Top sirloin steak can vary a ton in size, so take the cooking times in this recipe with a grain of salt, particularly if you have a very thick piece/pieces of meat. Make sure to use a rimmed baking sheet* so you don’t wind up with boiling hot steak juice all over your oven or floor. And cover your tray with foil, because sometimes when you are broiling this small amount of meat, the juices in the pan are thin enough to burn under the broiler. Don’t be alarmed if this happens, but foil is important here because it will protect your pan. Also, never use wax or parchment paper under the broiler!! Let your meat rest after cooking so the juices have time to distribute themselves throughout the steak, and when it comes time to cut, slice across the grain for the most tender slices. Not sure how to find the grain? Read this post from Serious Eats on the subject. As written, this recipe serves two but doubles easily. For doubling instructions, see recipe notes. Preheat your broiler on high and line a rimmed baking sheet with foil and lightly grease. Lightly score 4 shallow cuts on both sides of the steak, two in each direction (per piece of meat if your sirloin is in smaller pieces). Sprinkle both sides generously with freshly cracked pepper and salt. Place steak on the prepared baking sheet and broil for 4 to 6 minutes per side, until steak reaches your desired level of doneness. Remove from oven, tent with foil, and allow to rest for at least 5 minutes before slicing across the grain. While your steak is cooking, heat a medium skillet over medium heat and lightly grease with cooking spray or a small drizzle of olive oil. Add mushrooms and sliced green onions. Saute until mushrooms are lightly browned, 3 to 4 minutes. Add garlic and cook for 30 seconds. Transfer vegetables to a plate and return pan to heat. Add beef broth to your pan and bring to a simmer. Simmer for 3 to 4 minutes until reduced by half. Remove from heat and whisk in sour cream and mustard. Add salt and pepper to taste (if you use full-sodium beef broth, you probably wont need salt). If not ready to serve, you can keep the mixture warm over very low heat--do not boil. 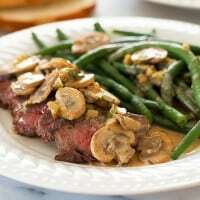 Serve steak alongside steamed green beans, with mustard sauce spooned over both. Enjoy! *I use button mushrooms, but you can use whatever mushrooms you like best. Doubling Instructions: Recipe doubles with no changes except a slightly longer simmering time for the broth to reduce by half.